The Cougars are hard in work in anticipation of the 2018 football season. The journey began back in December when off-season began. The calendar below will outline the main dates and information for the rest of the school year and the summer leading up to the beginning of school. Anyone is welcome to attend spring football practices with an emphasis on the "Feeder Pattern Night Practice" on May 17th, 2018 at Forester Stadium. The Cougar Athletic Booster club will provide hot dogs and the opportunity to meet the coaches and watch a football practice. All community members are welcome at any practice and a special invite for the Green/White Spring Football game on May 24th, 2018. We have many exciting players and would love to showcase the improvement in our football team and program over the past several months since the end or our historic 2017 football season. Please note on May 11th, 2018 we will be conducting athletic physicals at the Bryan Adams Basketball Gym. The cost is 15 dollars and no athlete may participate without a UIL Athletic Physical Form on file. Beat the rush and take care of this and the rest of the athletic paperwork. 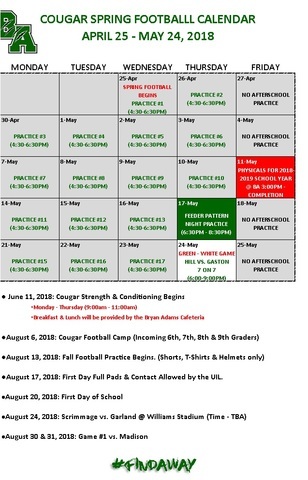 The Cougar Strength & Conditioning program is open to any Dallas ISD student and will be conducted from June 11th, 2018 - August 16th, 2018; Monday-Thursday from 9:00am-11:00am. (there will be two weeks taken off during the summer). Breakfast and lunch will be provided by the Bryan Adams cafeteria at no cost to the student.